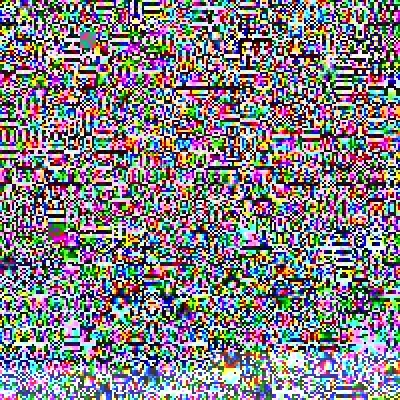 I now have a Flickr account and will be updating my hotlinks since web filters hate my domain. I decided that I wanted to have different sideart on each side so that I could get more art onto the cab, so I dedicated the left side to NES/SNES (the true beginning of my love for video games) and the right side to a variety. 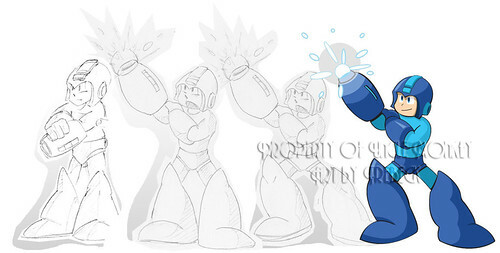 Here are some evolutionary pics showing the progression of 5 of the 6 foreground characters. I told him that Luigi was my main man, and he proceeded to create the greatest Luigi pic.....ever. 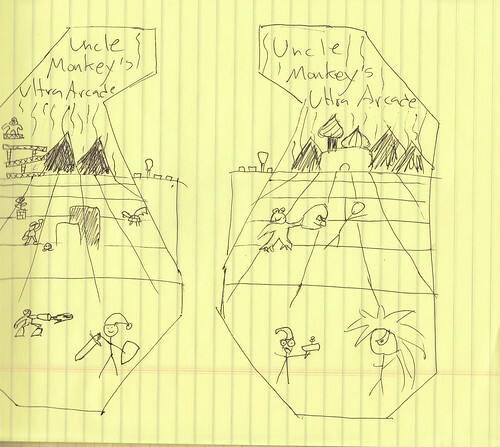 With Link, we tried a lot of things, but ended up going back to the first sketch. I like the idea of young Link heading out on his first adventure over a more experienced and world-weary Link. I loved the "gun show" look that trebeck came up with, so a front leg bend and smirk later, MM's ready to go. With Kirby, he sent me a sketch and asked if I wanted Kirby in one of his costumes. 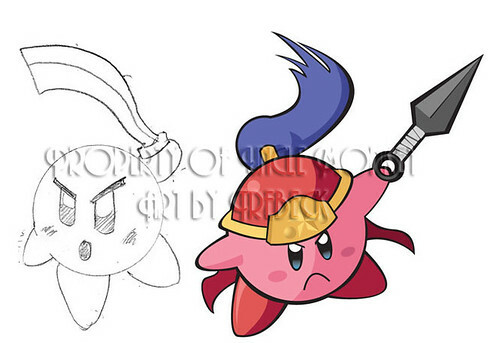 I told him, Ninja Kirby of course, and next thing I know, he's in my inbox, complete. 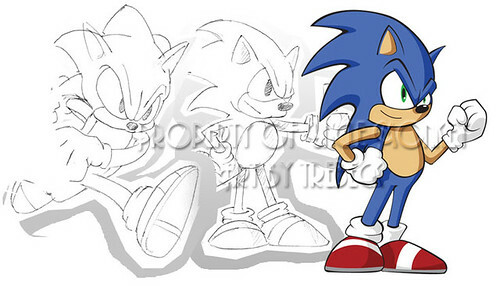 Sonic will be done soon, and next up is the logo, possibly with a mascot. In the meantime, I'll include some sideart mockups and pics of my CP later. Nice artwork! The cab will be totally worth it. I started the same way as you. Building custom PC's and working with emulators. A cabinet is the perfect fit! BTW my father lives Korea! I liked the running pose, but we both agreed that it didn't quite gel with EJ's and Kirby's poses. So he tried the thumbs up, but it didn't have quite enough attitude. So...I found a sprite sheet that had this pose, and trebeck came through again. woo hoo. So now that the big six are ready, we're working on a mascot and logo, and I have begun compiling scenes to go into the background. One in the middle in full, glorious color, and one further back that will be in the tron/battleground line style. 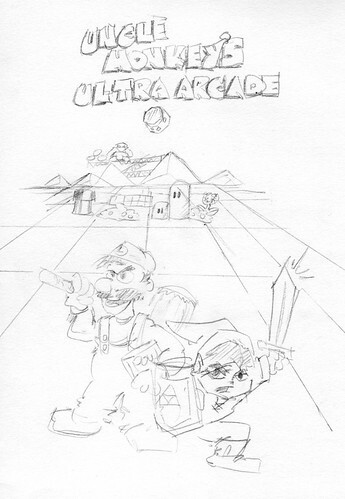 So here's the first one, a mashup of the 5 NES and SNES Super Mario games. Wow Trebeck has some skills. Wow, that is some top notch artwork. Looking forward to following your progress! After a gazillion years, the project is back underway. Artwork is finished and ordered. Pics soon. Does anyone have any good suggestions for speakers? Wow, nice job on the art guys! Ok, here's the art for the bezel, any thoughts? Love the art. Looks like you can watch movies on that monitor too! It ties a lot of very different characters together seamlessly, which is not an easy task. 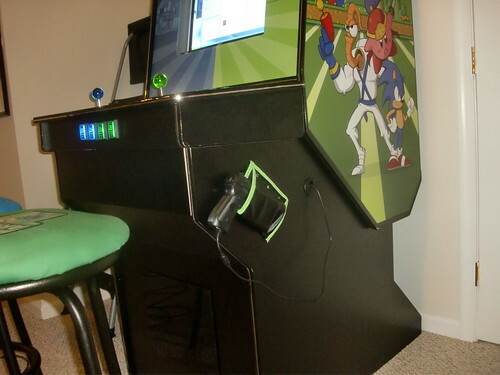 Hey, just chiming in to say this arcade unit is looking really spiffy! 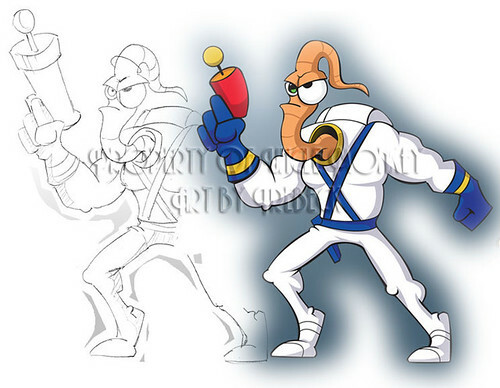 What was the inspiration for the control panel artwork? Are those original characters? Absolutely, they represent me, my wife, my son, my daughter, and my stepson. CP is done and tested!!!!! 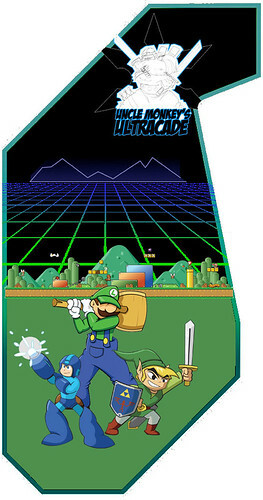 Reason for the choice of Link and Sonic was that the other 4 characters from the side art will be on one of the stand-alone controllers. I's been said over and over again, but EXCELLENT artwork. I really like how everything is split up blue and green. 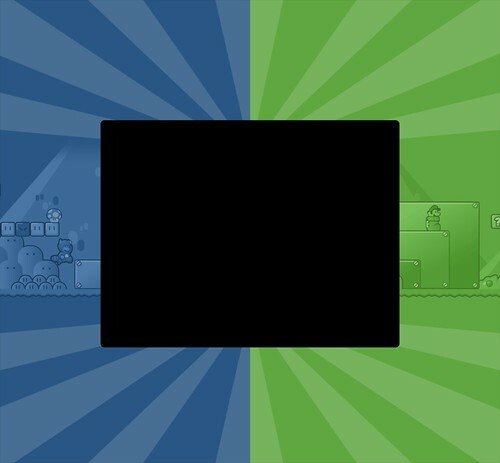 It is a great color combo and visually pits left vs right. Love it. love the entire build - excellent!! Took me ages to finally get the pics to download don't know why but i'm glad it's fixed. This looks great... 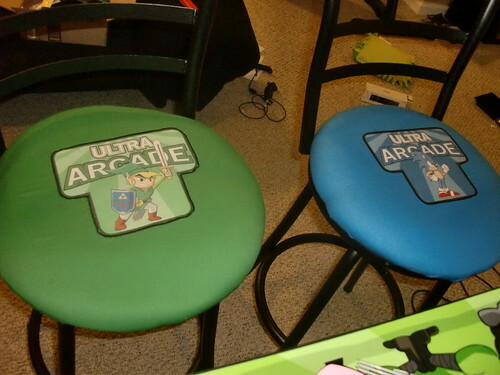 I love the stools. 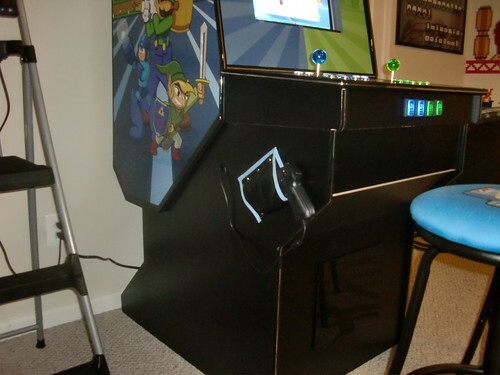 I was wanting to do something like that for my son's build, but I ran out of steam (cash ) at the end of my project. I still have in the back of my mine doing some sort of custom stool. Ok, just in case anyone is actually following this project, here's an update. I am currently located many hundreds of miles away from the cabinet, so any work on that front is on hold until June. I left it with a few arcade games loaded in MAME and the full NES and SNES libraries for the family to enjoy while I'm away at this fantastic Army school. What I did do is bring the 2TB hard drive with me so I can work on the frontend and such. So......I am currently in the process of creating custom system themes for hyperspin. So far I have MAME, all the Ataris, all the Nintendos, and all the Segas complete. Still left to do is the Turbo-Grafx family, NEO-GEO family and all the little Misc systems. I will post screenshots soon and video later. Nice wiring job! I have a question about how this is going to work. My project is also utilizing U360s. 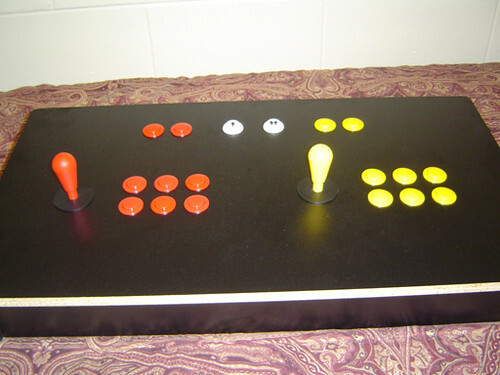 I notice you have the buttons wired directly to the stick, as well as wired to an IPAC. Am I correct to assume that when a button is pressed, it will register as both a joystick button input as well as a keyboard stroke? So, if that is true, when inputting into a game that is configured for joystick controls, you should have JoyX, JoyY, and buttons 1-8. But when inputting into a game that is configured for keyboard controls, you have the buttons mapped (via the IPAC) to keystrokes via your wiring, but how does the joystick work as a keyboard? it doesn't, not at all, here's how mine is set up: the harness for the U360 has room for 8 buttons, and when you connect the U360's USB cable to the PC, it reads as a gamepad (like a XBOX 360 controller would) So I wired the 8 buttons next to the joystick into the U360s. This keeps things simple if I ever want to pull my CP up and take it to a friend's house, plus Ultimarc says you'll have better reponse time on those buttons that way. 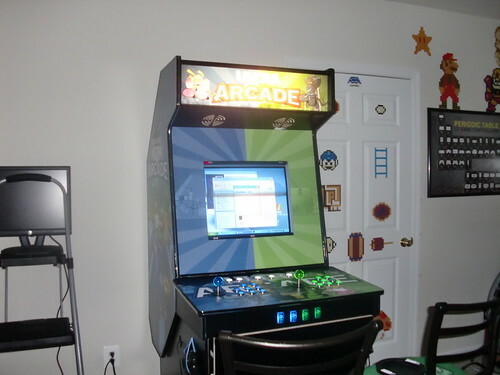 The IPAC only has the four coin buttons and the six admin/player select buttons (the white ones), plus if I ever put in pinball buttons, those also. 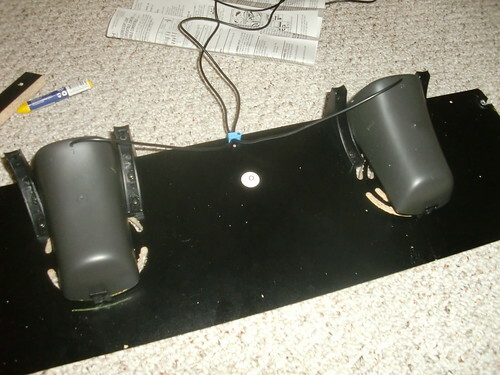 The extra wires you see coming from all the buttons are for the lights going to a LEDWIZ. 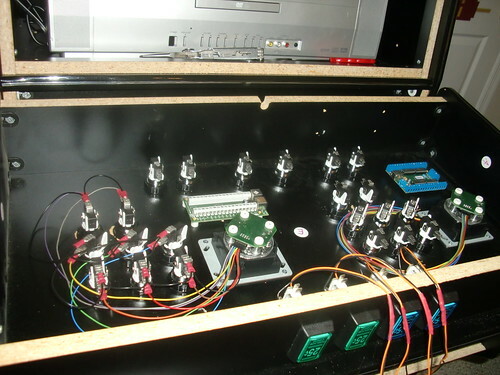 I'm pretty sure that wiring your buttons to both the U360 and the IPAC could cause issues, so I would either do it like I did, or just wire them all into the IPAC.....or, if you have 16 buttons or less, wire 8 into each U360. If you're set on trying to do both, I would consult someone more electrically experienced than myself, because when I was considering it, I was quickly shot down and confused. Hope this helps, let me know if I was unclear or if you need more info. Ah yes, didn't notice that board was an LEDWIZ. That clears everything up. Thanks! Yes, a fighting snow man does exist! That cabinet you made looks amazing. I like the design you put into it as well(the older Nintendo and Sega generations really fascinate me). 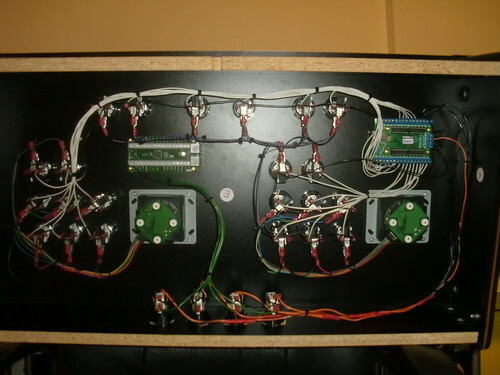 The control panel looks inspiring to me(since me and my father are building a MAME cabinet). Can the U360 joystick be bought in non-LED form? If so, can it be easily modified from 4-way to 8-way? Also, what brand of buttons did you use for your cabinet? The U360 doesn't actually come in a LED version, I had planned to light it from below, but those plans have been put on hold until I rebuild the CP sometime way in the future. (Any glow you see in my pics is ambient light reflected in the translucent Hard Candy balltops from Groovy Game Gear). 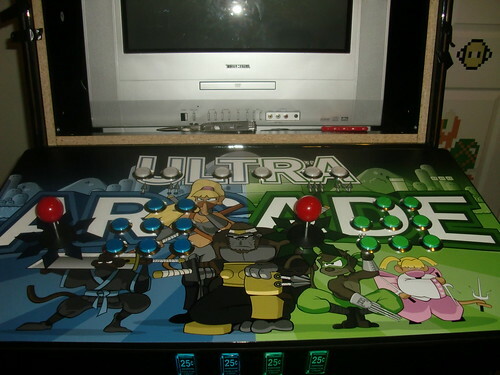 Someone HAS modded the U360 to have a lit balltop, search the forums for instructions, but that is way past my skill level. The U360 is actually an analog joystick that you can program to be 4-way, 8-way, 2-way or whatever you desire. But you do pay for the versatility. 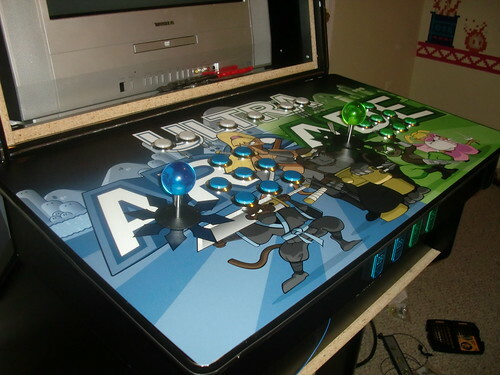 Ultimarc has a joystick that switches from a true 4-way to a true 8-way by pulling up on the stick and rotating, but I suggest doing a lot of reading before deciding on a joystick. 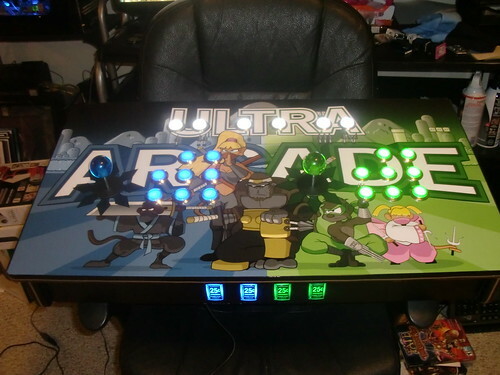 The buttons I got are also made by Ultimarc, they're called the Ultralux. I bought them because at the time, they were the only decent LED-buttons available for a NOOB. Everyone here was pretty much still modding theirs. Now there are quite a few options, so do your research. Thanks for the kind words, best of luck, and if you have any other questions, there are lots of geniuses on here.....or you can ask me.